Have been distracted - starting some new large pantings, which are taking up all my time, hence the gap in blogging. Here's a pic of my studio from Sunday. I've finished a new version of 'Half and Half' from earlier this year. It's slightly different and was definitely as fun to paint as the previous one. This one is called 'Syncretism Of The Halves'. 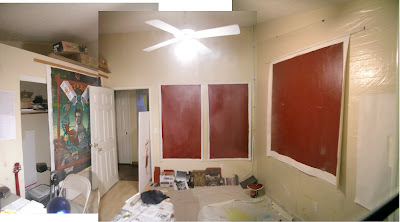 I'm intending on making a triptych painting out of the three new primed canvases hanging on the wall.